Your gulf-front vacation home in a magical, paradise cove awaits you. 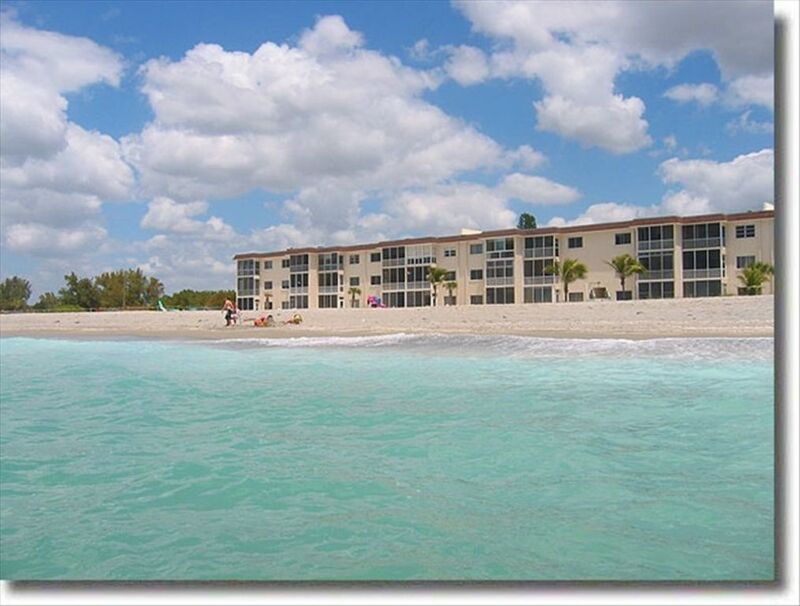 Located directly on newly refubished beautiful Turtle Beach in Siesta Key and just steps away outside your door. There is no other resort complex like this that is so close to the beach! You’ll awaken to the energizing sight of the sun and the sounds of the gentle lap of the waves just outside your windows and private lanai. This rare ground floor condo offers two bedrooms each with their own bath, roomy closets and a choice of a comfortable king in the master bedroom or two twin beds in the guest room. A bright, inviting and cheerful kitchen offers every amenity at your fingertips. An open and spacious living area features bright ceramic tiled floors, a queen sleeper sofa, a love seat and inspiring views from every angle. Relax and enjoy the large flat screen TV with premium cable service and feel free to tape your favorite shows using the DVR! Look out onto your lanai and its breathtaking 180 degree view of the gulf. Enjoying your morning coffee, you’ll have so many exciting options as you plan your day. Perhaps you’ll step out your private back door, sink your toes into the sand and watch the dolphins play, or wander out the front door to your boat dock on Blind Pass Lagoon. Will you adventure out to kayak, or set sail with quick access to Little Sarasota Bay and the gulf beyond? Will it be a dip in the pool, or a leisurely bike ride to the nearby playground picnic park, the white sands of Siesta Beach, the tantalizing and diverse food offerings on Midnight Pass or shopping in quaint Siesta Village? As evening approaches you’ll want to enjoy the unsurpassed views of the Siesta sunsets. Will it be dinner by candlelight on your lanai or a night out on the town? It’s your choice, its your vacation, it’s your home. Book now-you deserve it! Large flat screen HDTV in living room! with premium cable service, on demand and DVR so you can record your favorite shows! Also TV's in both bedrooms. DVD/VCR, Wireless Internet Connection, Fully Equipped Utensils provided, Plentiful Linens, Boat Dock, Boat Ramp, Picnic Park, Washer/Dryer (shared facilities), Beach Chairs and Umbrella, Lanai with direct access to the private beach or the public beach, Sleeper Sofa, Elevator to Upper Floors, Luggage Carts. Elevator provided. Great condo right on the beach. This is a fine place for a quiet time with family. It is at the opposite side of the key from the white sand beaches and spring break bars and traffic. Our family found this location to be perfect. The beach was steps away. The first floor made everything accessible. Watching the sunset every evening was spectacular. The condo itself needs updates, pots and pans were worn out. Basically clean, but some areas could use some attention, like the lani and kitchen. Loved the Fisherman's Cove location and privacy. We are glad that you enjoyed your stay and thank you for your valuable feedback! We have replaced the lanai furniture with a beautiful new set. We are in the process of replacing any of the pots and pans that were damaged. Hope to see you again soon. Sweet spot at Siesta Key! This was my first time using VRBO and staying here! If you are looking to get away to the ocean and have peace and quiet, this is the place! It’s not fancy but super clean and all the accommodations were perfect! It’s right on the ocean front! The views are amazing! The property was very comfortable and roomy. We loved the Florida room in the back. Easy access to Turtle Beach and the bay. Beautiful sunset view. Easy drive to Siesta Key Beach as well. We had everything we needed. Considerably less crowded and quieter than than Siesta Key...but the sand is not sugar white. Still a very nice area and we enjoyed our stay. Thank you for your review and for taking such good care of our property. We are glad that you enjoyed your stay and hope to see you again. Perfect. Steps to the beach. Thank you for having everything we needed to spend our days on the beach and a very comfortable place to sleep at night! We will definitely recommend your condo to others.